Salvia chamaedryoides or germander sage is a native of Mexico. It typically flowers from spring through fall with an occasional trimming. 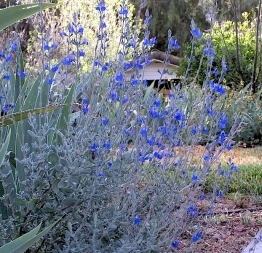 The flowers are a true clear blue and are hummingbird favorites. The sized is roughly 2′ x 2′ which makes it ideal for meadow gardens or borders.